Since my parents were out and helped clean up the Z from it’s long slumber, I’ve been roaring around in it and really goes through the paces. 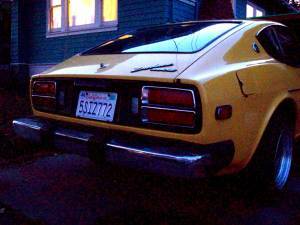 But I’m not gunning it like a hooligan – I’m finally wanting the 280z to be…better! 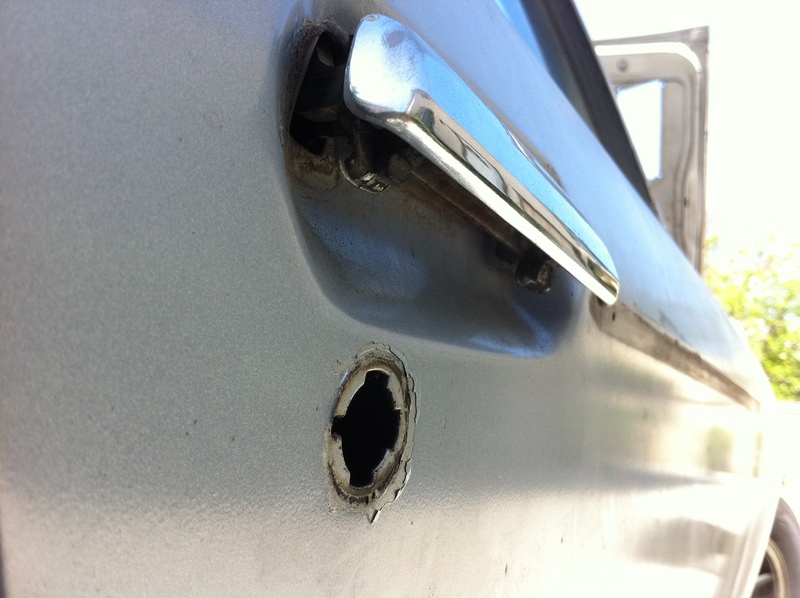 3) Rear Hatch Guides – what?! I was just going over missing parts, and this one was funny; such a large piece and i never put it back on. 4) Rivet Fastener / Push Clips – Wow – so many holes to plug up. Good thing I picked up a rivet / fastener set at Amazon (for this and all my other cars). 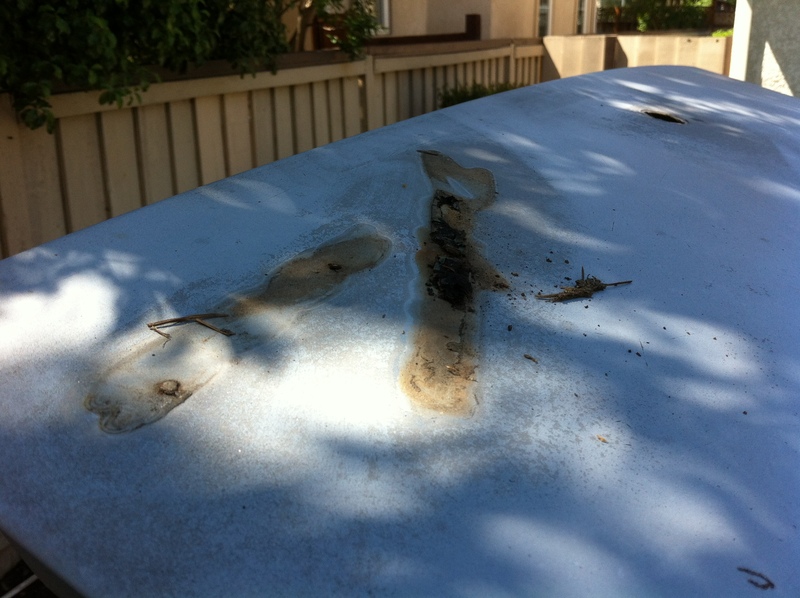 5) Clutch – Yep, we bled the clutch already, but I noticed it getting soft again. 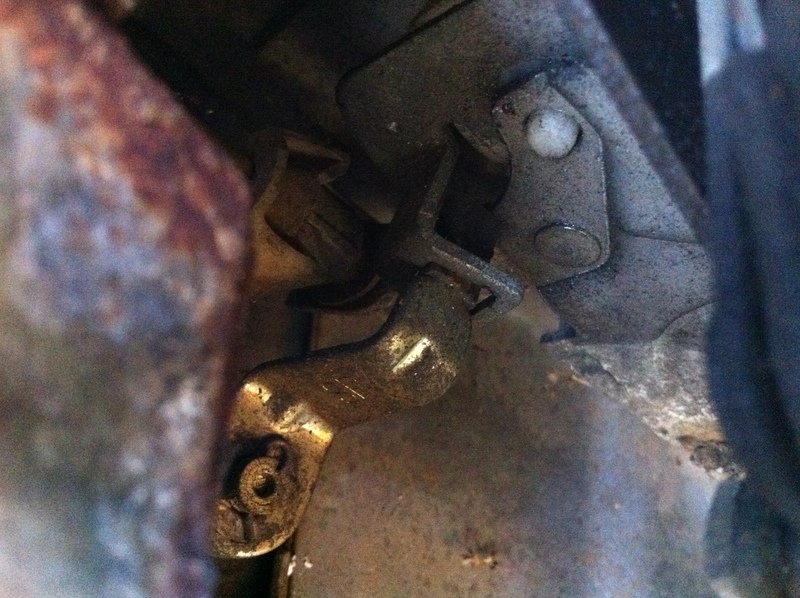 I’ve already purchased a new clutch master cylinder, however I may look into rebuilding the old one too. 6) Shocks – I’m tired of this thing riding like the baby of a Caddie and a boat! 8) Bushings! – Yep, still have these and yet to be installed. With the rain coming, it’ll be good to get this thing on blocks and start having at it. 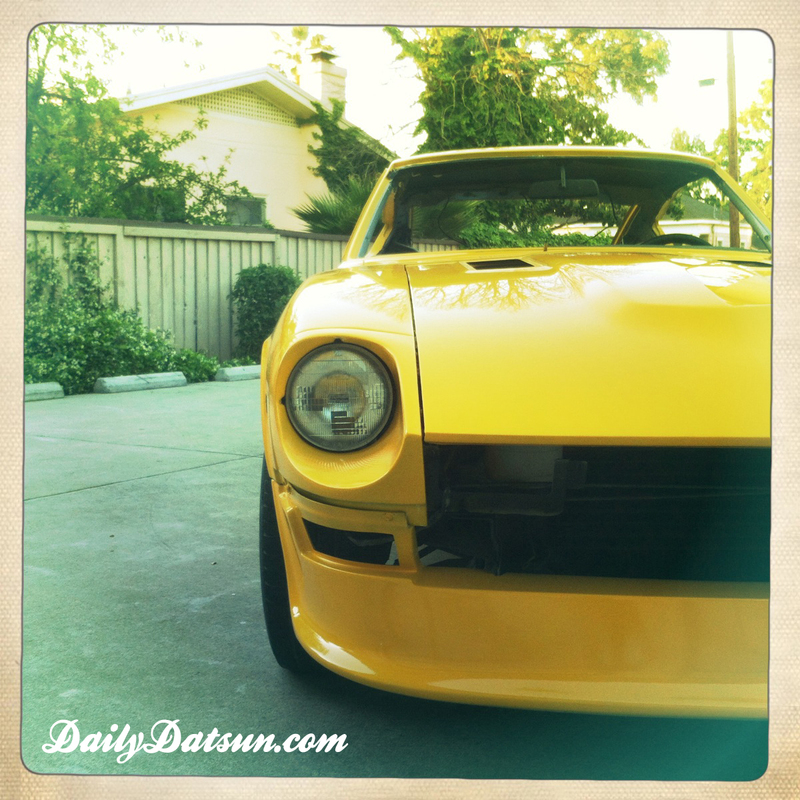 Daily Datsun mornings are back! Anyways, like all non-working AC cars, you gotta find that sweet shade in the summertime. I have to admit, i’m getting pretty good about it. You at least have to crack the windows open a bit, get that sun shade out (maybe even a window shade or two), and if you can, find that ultimate shaded spot. But not all shades are created equal, I’m afraid! No no no, NEVER park directly under a tree if you can avoid it. Summer is in full swing, berries and fruit is in full bloom, and the birds.. those terribly messy birds… are calling a picnic. Sometimes I even check the trees when parked just to make sure – but somehow they know. They know you’ve just washed your car. They know you’ll be gone long enough for them to call all their bird buddies. Crack open cans of berry juice, and let all bowel hell break loose. And as they’re slumbering away in the cool shady tree, all they can dream in their bitty birdy minds: “oh yeah, we done good. We done real good”. Baked berry juice: a real b*tch. 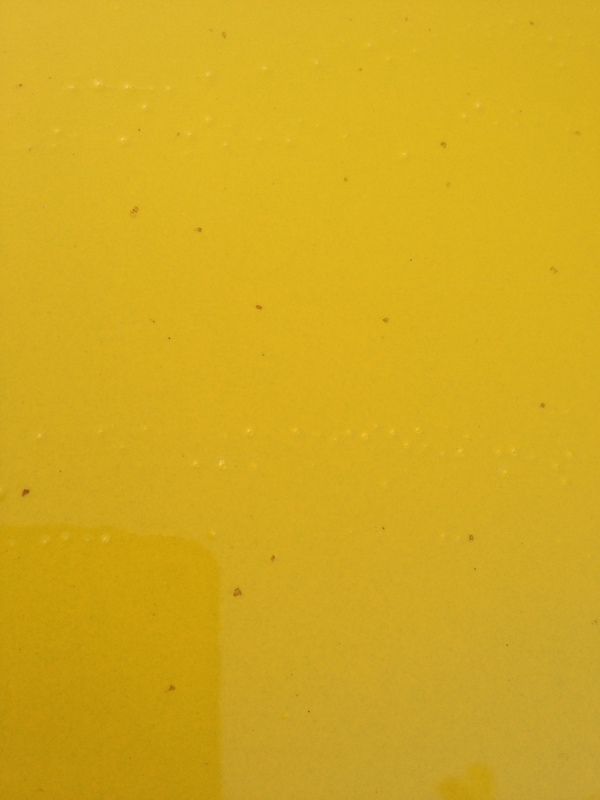 No that’s not high-quality paint flecks; that’s berry stains…after a wash and scrub. Image the whole car, littered. 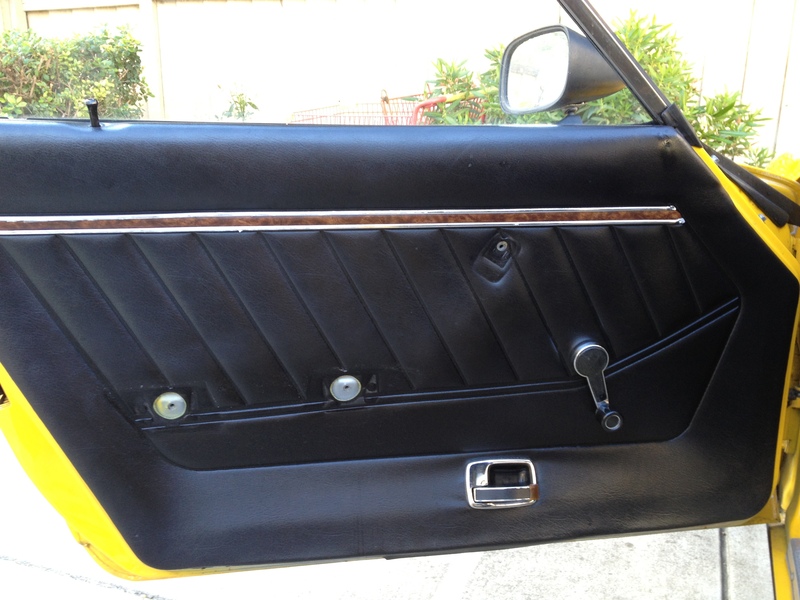 A few weeks ago, I noticed the door handle of the 280z just kinda hanging loose… Still able to open the door, but a loose handle could mean eventual non-working doors, and cross our fingers, maybe prone to brake-ins. 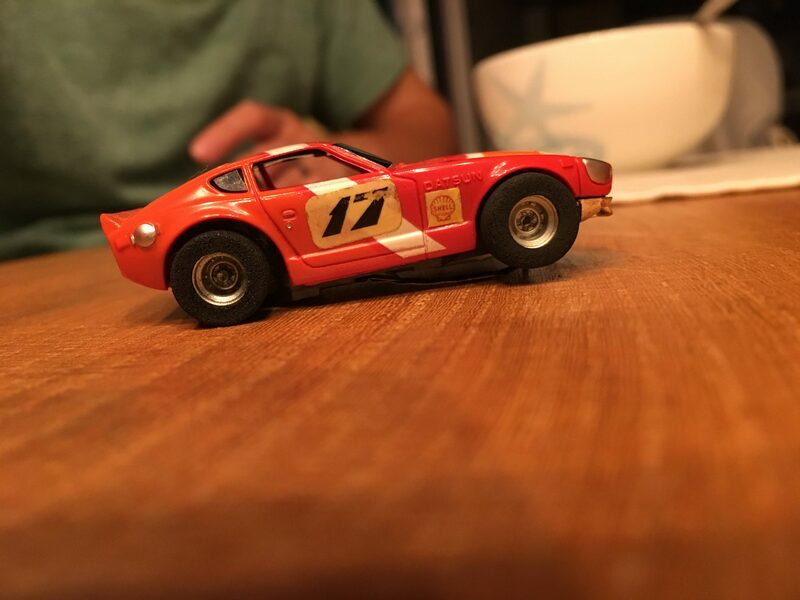 If anything else, the tolerances of the Datsun 280z are surprisingly tight in some places, and a loose door handle can actually mean chipped paint! ouch! (you can spot the chip in the lower right). I took an hour this morning to fix it all up and correct a few things along the way – let’s go! Per the S30 service manual, take off the arm rest, window crank, door escutcheon plate, and don’t forget the door lock post (just twist to take that off). 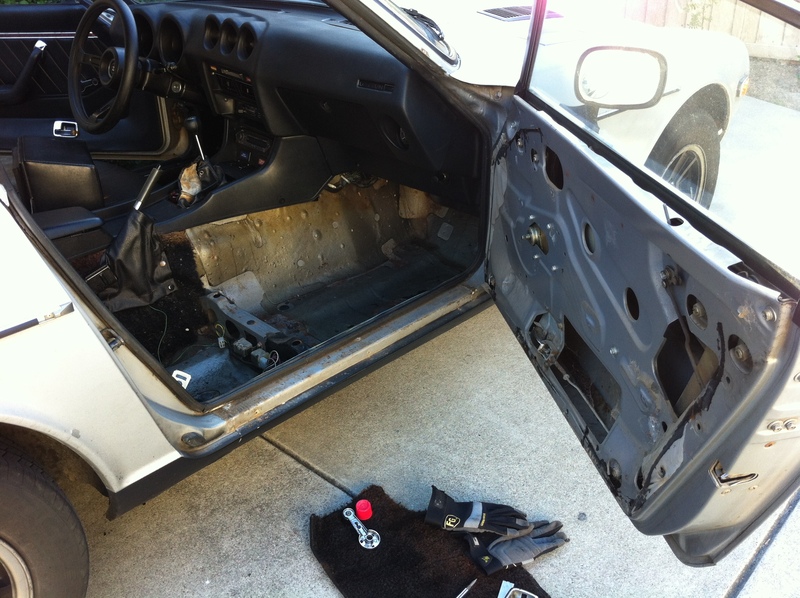 Using something flat, gently pry off the door panel. Once you have that door panel off, window all the way up, you’ll be able to see the two nuts holding the door handle in. 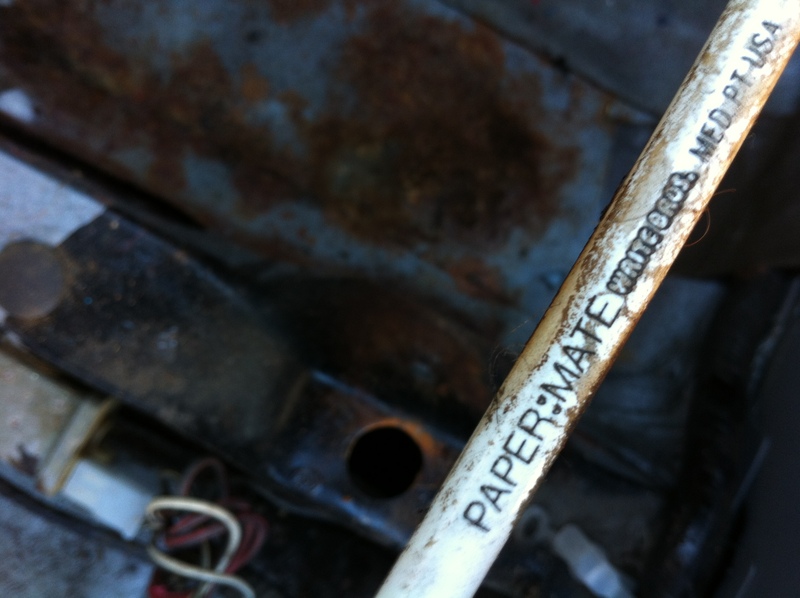 Use that 8mm wrench. In the meantime, I also able to finally glue the vinyl covering and lube up the door lock mechanisms. 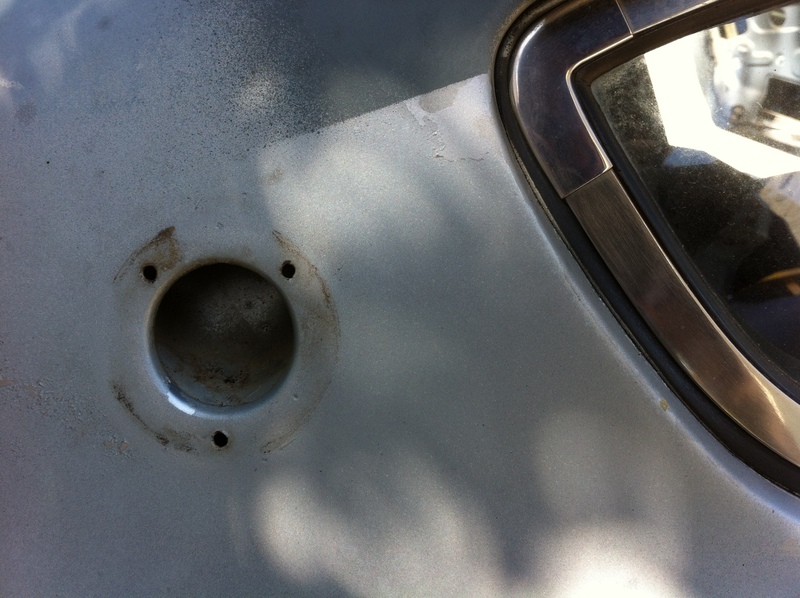 When put back together – that door couldn’t close sweeter, and the door handle is perfect. Eh.. now for the reason why I noticed this in the first place was the paint chip caused by the loose door handle…eventually have to get to all these stupid paint chips. Yep – got a door ding. sooo unhappy. Parked in an asian market next to a guy opening his doors of a green Explorer. We wanted to get to his rear passenger side door while i was getting out… he waited. I went into the market. When i left the market, he was still parked next to me. It’s not until i got home that i noticed it.. right above the door handle. Now every morning, this dime-sized shy of a paint chip glares back at me. arg. Well, better brush up on my painting skills. WE MADE IT – we did it! What started as a daily driver project, transformed into a serious restoration and finished as our wedding chariot. My fiancee and i tied the knot on Sunday, May 27th with a wedding nothing short of amazing. And getting this car completed on time was definitely a part of that weekend. 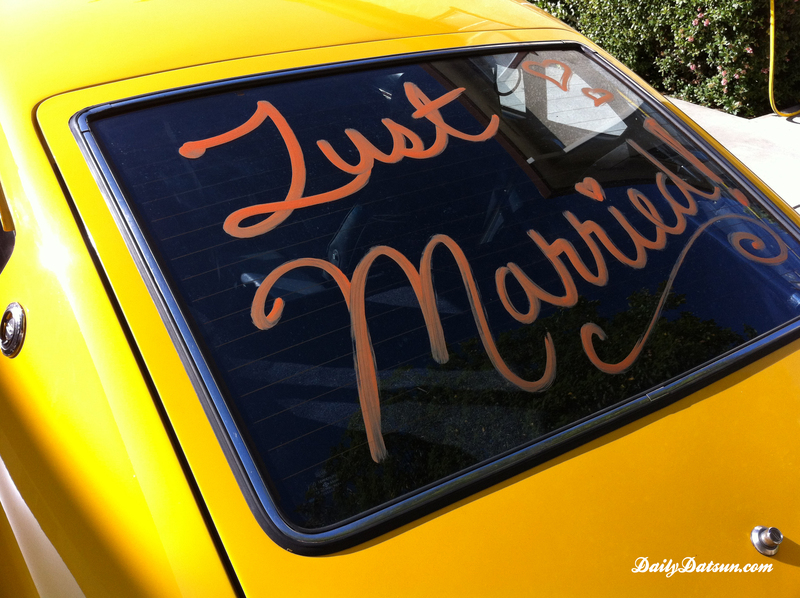 4 days and 10 people later, the 280z barreled it’s way over to our hotel and drove us to our wedding. Truly starting the week before, I had already ordered the parts i had needed for the final assembly – window seals, weatherstripping, carpet, seat covers, and a front windshield (more on that later). I needed to those parts ordered quick to be ready as soon as the car came back. Once the car rolled out of the painters garage it was already Tuesday evening – literally only 4 days and 5 nights remaining. That night i got straight to it, sorting out the pieces getting it ready for a full attack the next day. We quickly got into full swing with my brother Kris and a groomsman Erik helping hammer it’s way back to road-worthiness. 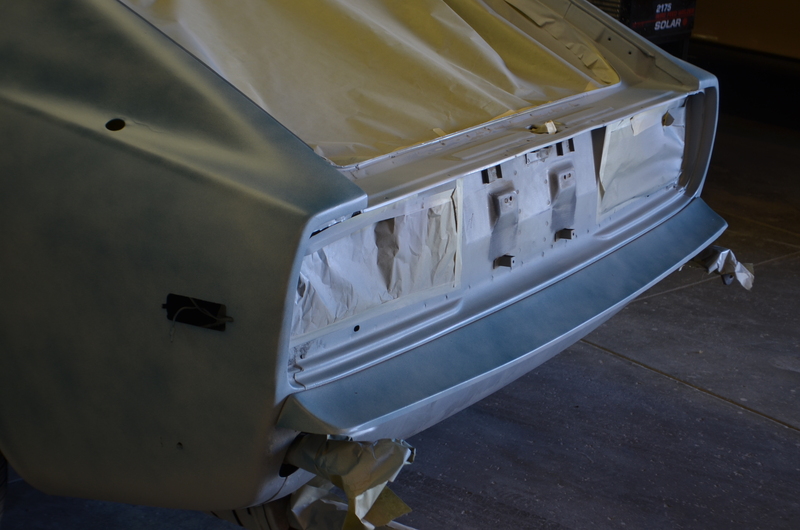 We were able to complete the rear tail lights, some trim repaint, side marker lights, headlights, hood louvers, hood rubbers, floorboard prepping, and the front feet area of the carpet. Thursday rolls around for another big day. During the afternoon I had the neighbors install the front and rear windows – truly a blessing to have a family who owns an auto glass repair company live next door to you! Late afternoon, brother brought over another groomsman Jerry and his girl Kennie (who had just both come over from Hong Kong) to lend a hand, helping clean windows and tackle the carpet. Carpet continued to dominate our time because of the measuring / cutting required for all the interior fittings: both sides of the seat belts, shifter, e-brake, and seat rail holes among other things. Carpet needs to go in first because it instantly transforms the visual impact of the car. Additionally, once that’s in, seats, center console, door trim, all that can go back in. Later that evening, I had three more sets of hands arrive: my future sister-in-law Dana, my sister Kathryn and her boyfriend Jake! It was great, we all had our hands on this thing! Jake and Jerry tackled doors, Kennie and Dana helped clean parts, Kathryn helped me assemble the last seat, while Kris had the dreadful task of installing the rear driver-side interior quarter panel trim. Imagine having so many people who, for the majority, have never worked on cars (let alone re-assemble one) all help out at the same time – yes, it was a circus. Yes, you’ve gotta make sure all the correct bolts were used. But truly it was such a fun experience. I love working on projects with friends, more so with my brother and sister! To top off the night, even LATER that evening, my parents flew into town, and they too dropped by to check out how things were going. I wish i got it on video / photo, but both my mom and dad would later return the next day to help out to complete the re-assemble. 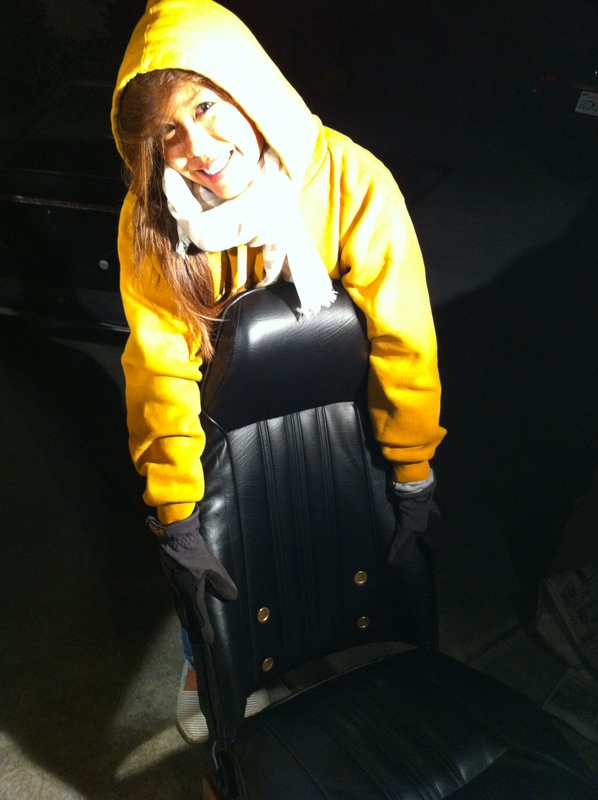 Friday, My dad and i put in the seats, dash and door trims; while my mom cleaned parts, and even tackled the biggest task: clean / organized the storm of parts and trash that my garage was left in the previous night. Yes, I definitely should have gotten photos of my mom and dad helping out but we were just so focused on getting this done. 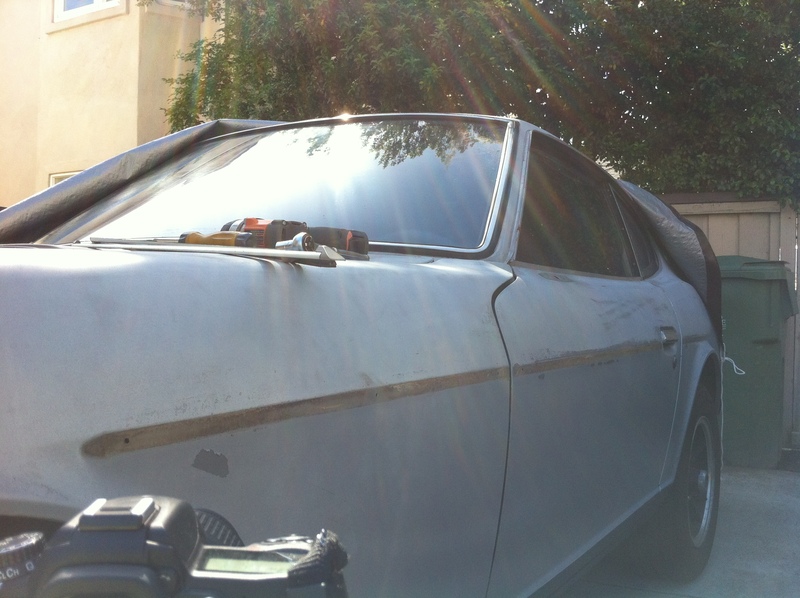 Wipers went on, the last three pieces of chrome front windshield trim were found and installed. 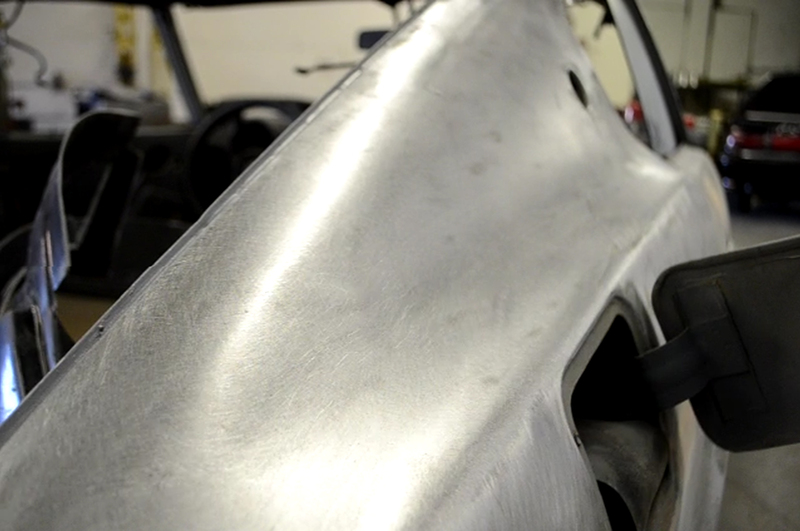 I got to say the whole project has been amazing, but there’s nothing like working on a car with your dad. More over, he’ll be driving it while we’re away on our honeymoon. It’ll be 40 years since he last drove a Z, and I can’t wait to hear what he’s got to say! I had a two hour window to install the final touches late Saturday afternoon – front grill, front parking lights and their trim, horn, side-view mirrors, and of course, the c-pillar ‘Z’ markers. I took it off the battery tender attached the night before, and started him up. Perfect – solid and strong. Looks – amazing and fast. I’m proud and thankful that my friends and family helped get car back on the road, and ready in time for the wedding. Sunday night we drove it back from the reception only to be stopped by a police officer 1/4 mile from our hotel. Doh. Were parts falling off? Lack of rear bumper? Nope. No tail lights. Brake lights were working but the car was “invisible out there” with no running tail lights. Luckily the officer was more concerned about our safety, and with the ‘Just Married’ sign and us still being in our wedding get-up we were let go with a congrats rather than a ticket. :] Sigh! now this rebuild story is complete! Pictures of the re-assemble will come soon – for now here are some pics straight from the painter that Tuesday afternoon. 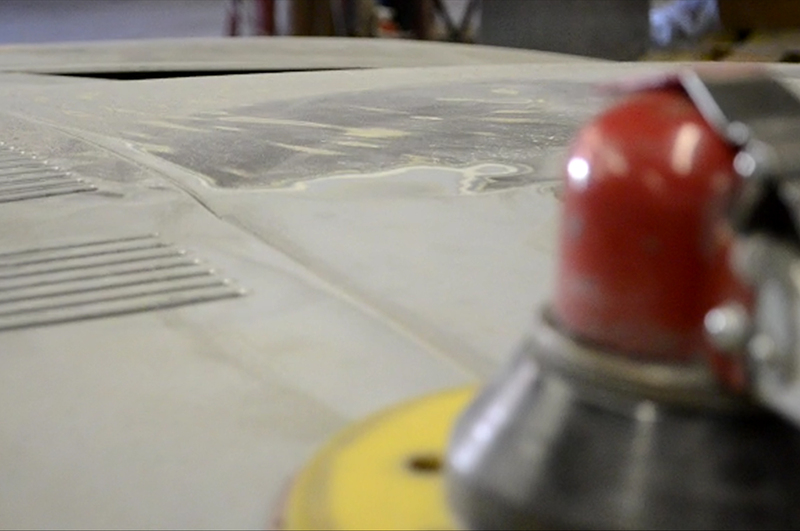 After driving it down the shop, he went right away at it with a sanding wheel! WWRRrrrll! Next, the guide coat. The guide coat is a light spray of color done all over. This helps him make sure no spots are missed! From here, it gets “blocked”. Blocking is a sanding technique of which i don’t know much about, but i know it’s important to get those surfaces even, smooth and consistent. And then the sealer. Even with just the sealer, you can see the lines really popping w/ all the reflections from the overhead lights. And this is all BEFORE primer! If you’ll notice in the next picture, we decided to take of the cowl (just above the engine bay) and decided to do it right. 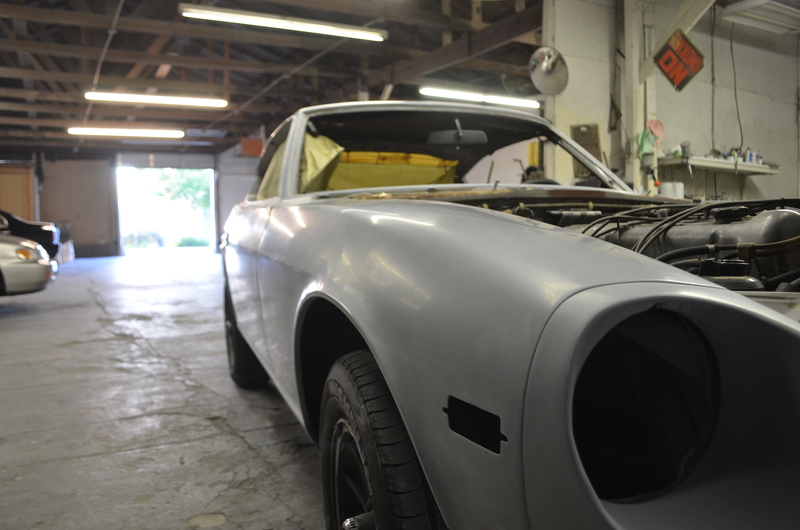 He’s gonna black out the inside, and paint in/out of the cowl. YES! 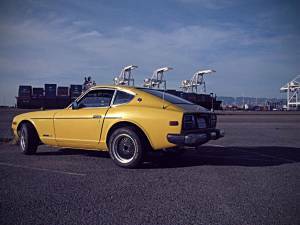 In April of 1977, this 280z rolled off the manufacturing line and on to the docks, headed for the Bay Area. Though his 35th birthday would’ve been more appropriate to celebrate last month, I wanted to post it along with his birthday gift – a new paint job. 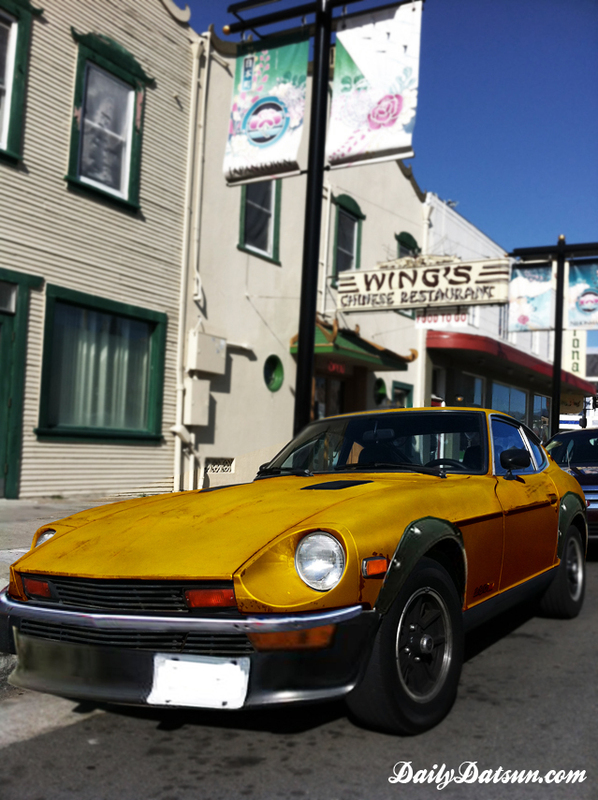 We’ve decided to take the 280z over to Rick at Pacific Auto and Paint, located on Santa Clara St in downtown San Jose. In the initial scoping for paint, Rick was very enthusiastic and very friendly about getting the car in and handling the job (more importantly, complete the work before the wedding!). So a short post before a separate painting post, but here’s a few pics to wet the appetite – bon appetit! Can you figure out what’s missing from this picture? 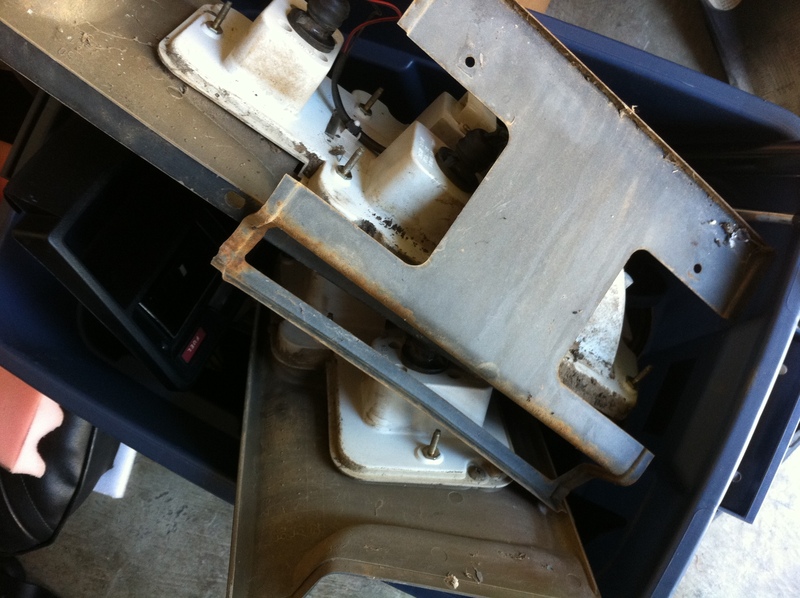 Removed the rivets with a 1/8″ drill bit.. all the rivet heads were piling up! The ‘Z’ side emblem removed. 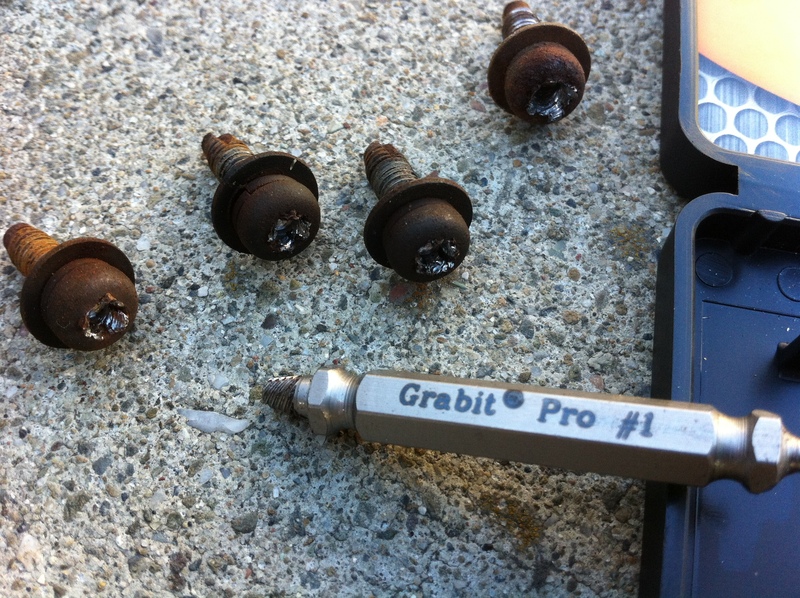 I’ve used quite a few “easy-out” screw removers, but Grabit is awesome. Many of the front valance screws were rusted tight, and the heads got striped while taking them out with a drill / screwdriver. 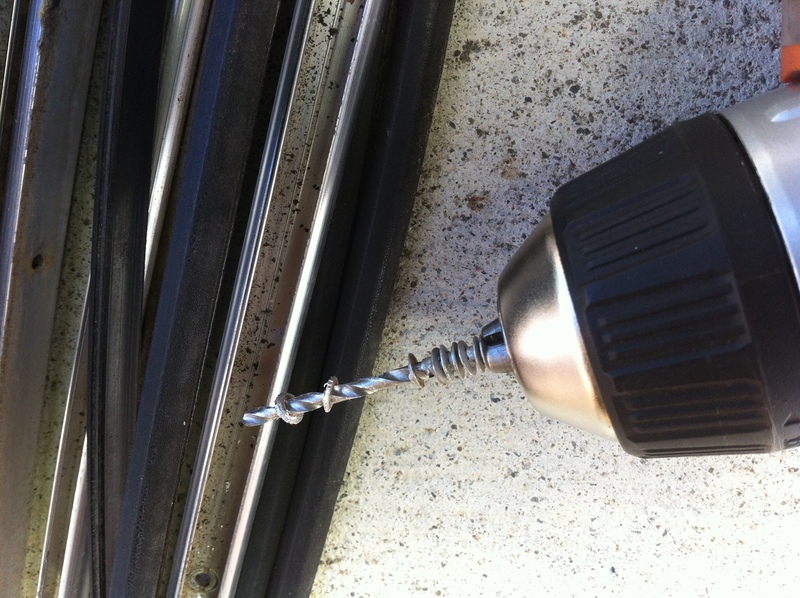 Grabit is a bit with a drill bit on one end and the extractor on the other. A set of 3 sized bits, it was worth every $. 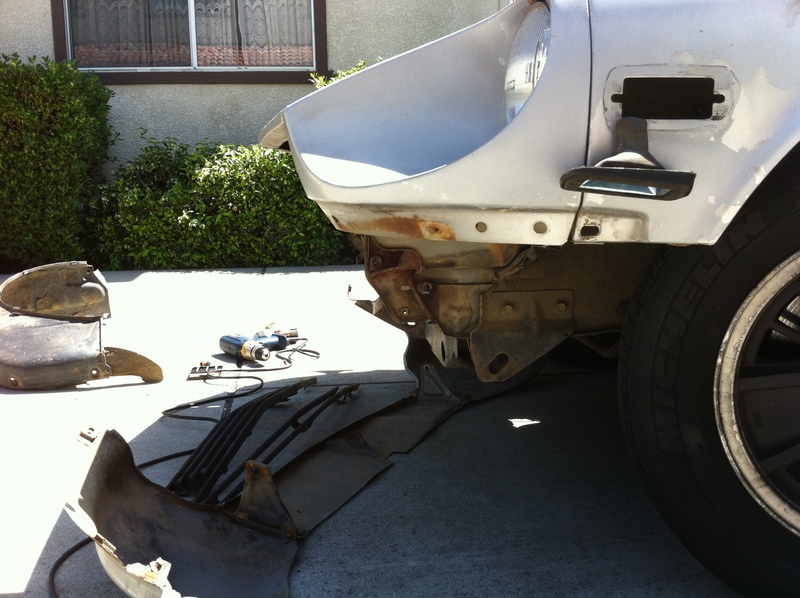 And it made quick work on getting the front valance off. 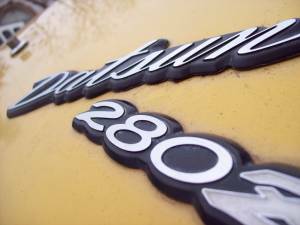 The ‘Datsun 280z’ comes off, along with the rear hatch lock. And thus i’m left with a bin of parts. OFF TO THE PAINTER! 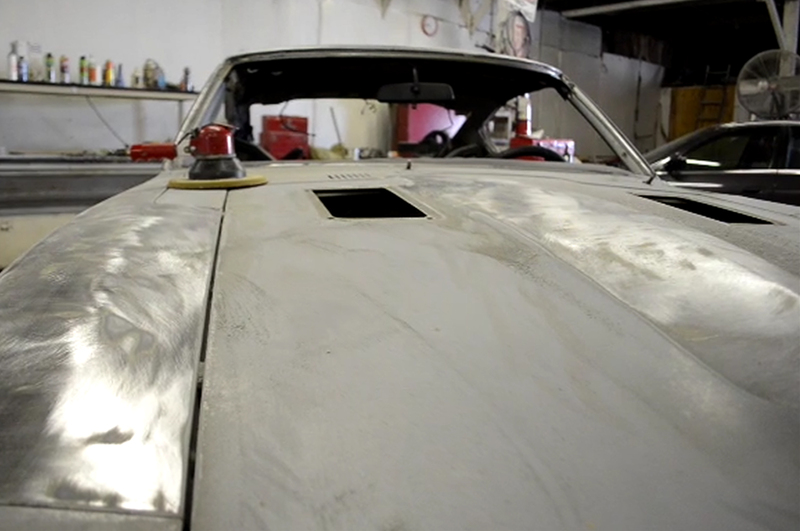 Yesterday I started to tear down the 280z. In about 2.5 hrs, I had the car just about 80% done before it can go to the painter. Passenger side door trim / seal: off. And I need to make more room in the garage to store all this. We’ll let the pics do the talking. 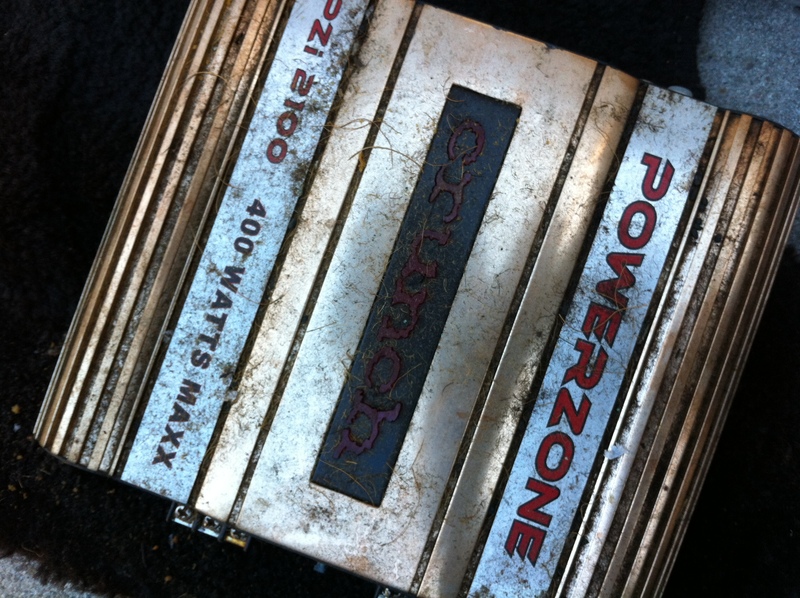 … a nasty 400W amp under the driver seat (that’s probably 400W PMP (max rating) haha, so more like 100W). And i’m now $0.39 richer. 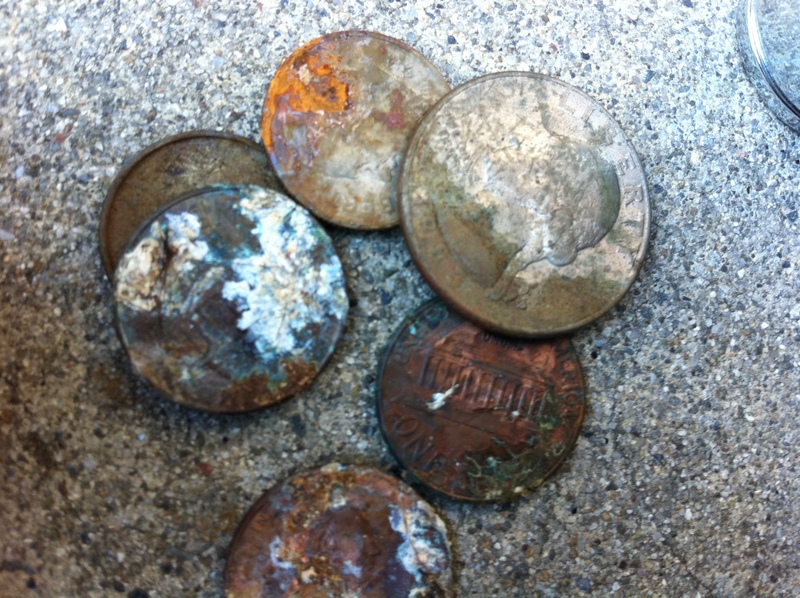 Oldest coin here though is 1983 (the quarter). 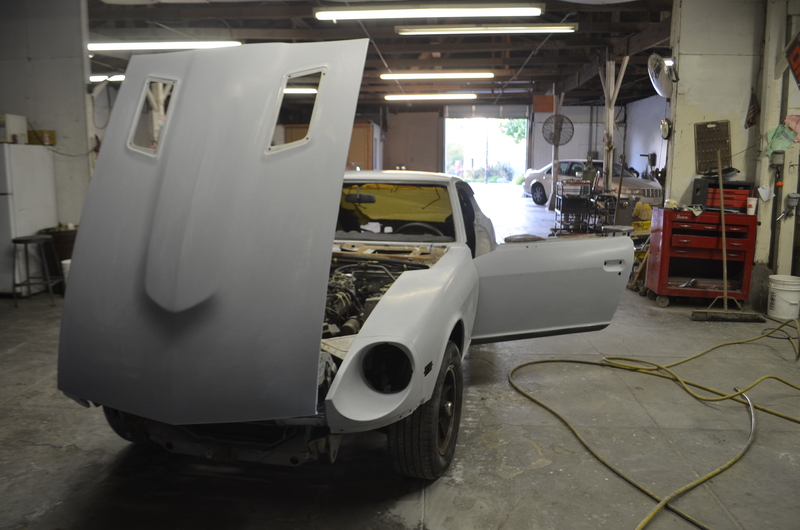 Well, it’s no secret, the car’s going to (needs to, really) be painted! 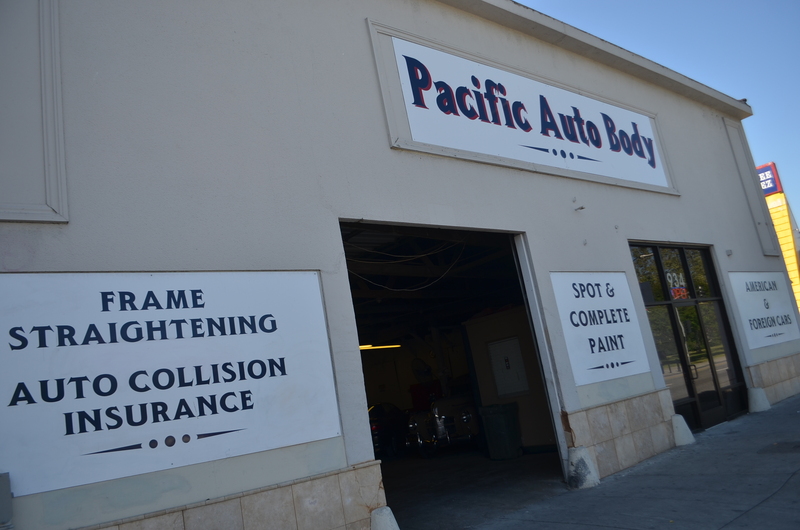 Luckily, there’s a great independent paint shop called Pacific Body and Paint that’s local. 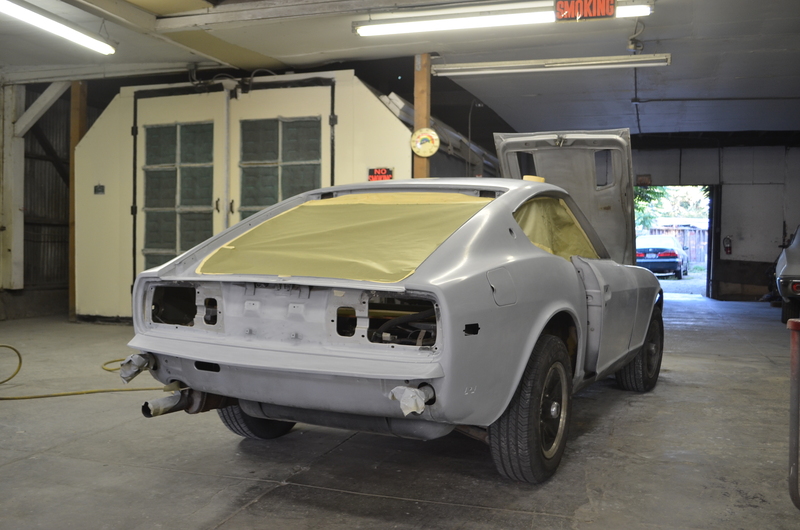 I got a chance to talk with the owner Ric, and had a lot of great things to say about the 280z – i could tell he was getting genuinely excited to work on the project! 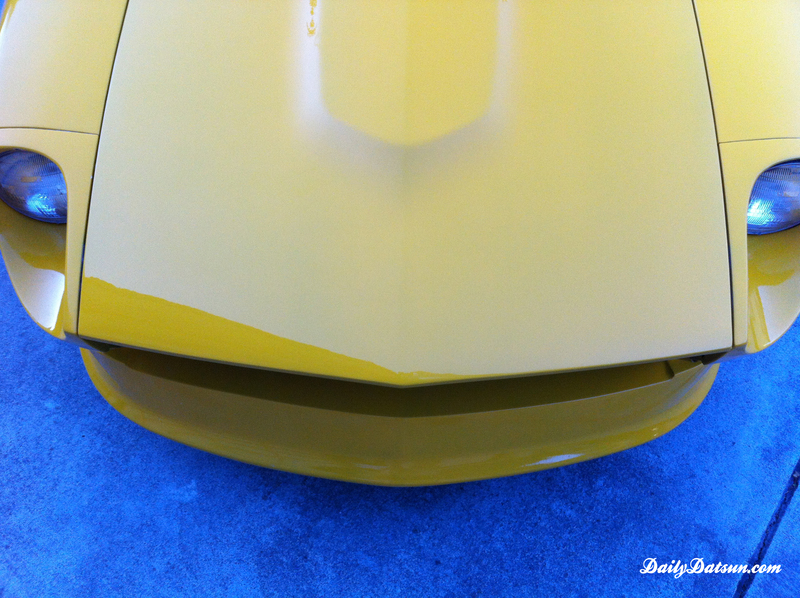 He took me onto his garage floor to show me some of his work; talked a bit about his methods and what my expectations were as we circled a early 70’s camaro freshly painted blue w/ white stripes. 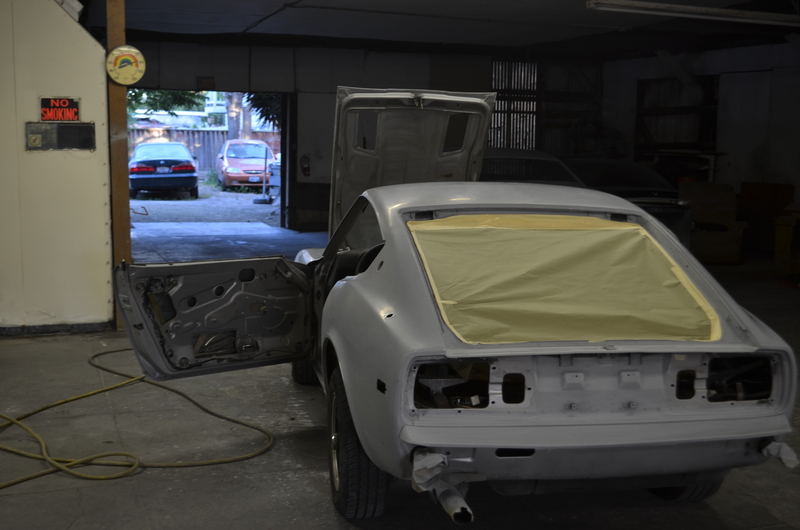 I’m looking at painting the car in a 920 Gold Poly, an original 240z color. Interesting thing about this color, are the countless remarks on forums say the original Gold Poly (920) paint you see today is different than when it originally came out (perhaps due to age) – that it used to look more yellow-brownish. 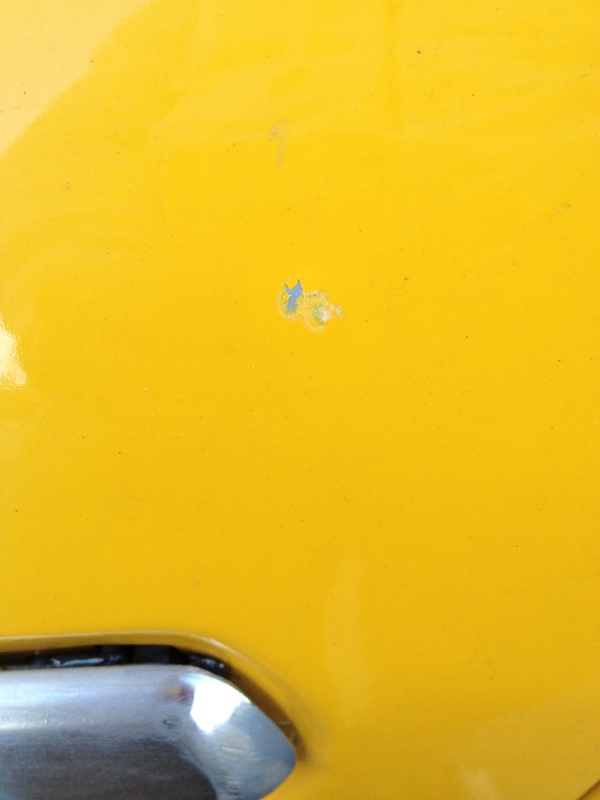 Regardless, this car is going to be painted in a yellowish-orange; very similar to the Butterscotch Blonde you see on classic Fender Telecasters – so whatever that ends up being… 411 Sunburst Yellow? 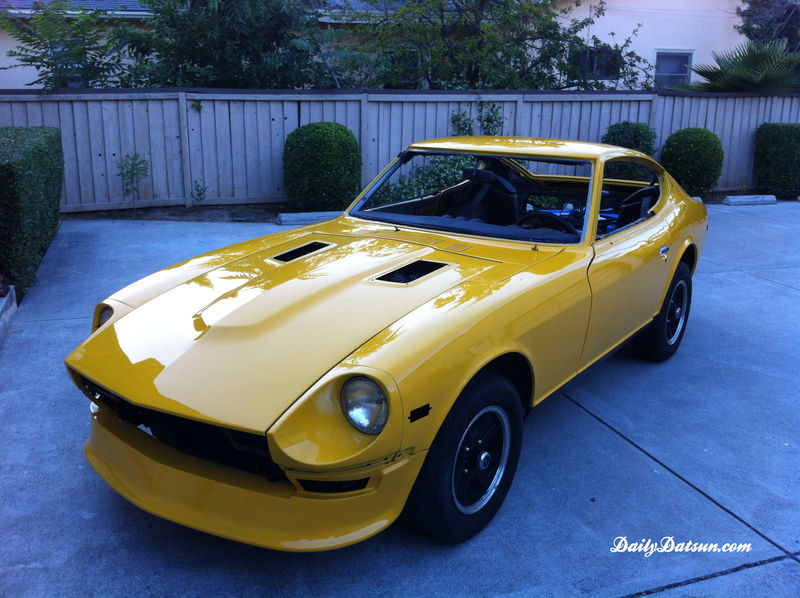 Since the beginning of the year, I had a poll out for the new color of the 280z. 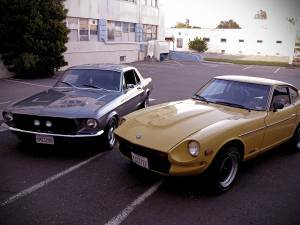 Which one will it be: a mean looking Datsun in Gunmetal Grey? A stunning White 280z? 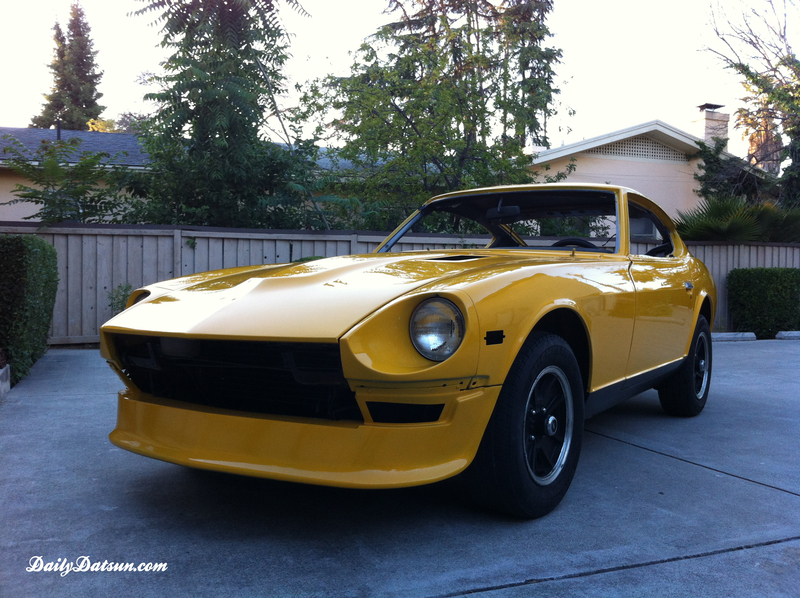 Or that Classic Gold yellow/orange (Datsun paint code #920) that keeps the 280z in it’s time? Click on the results to find out! 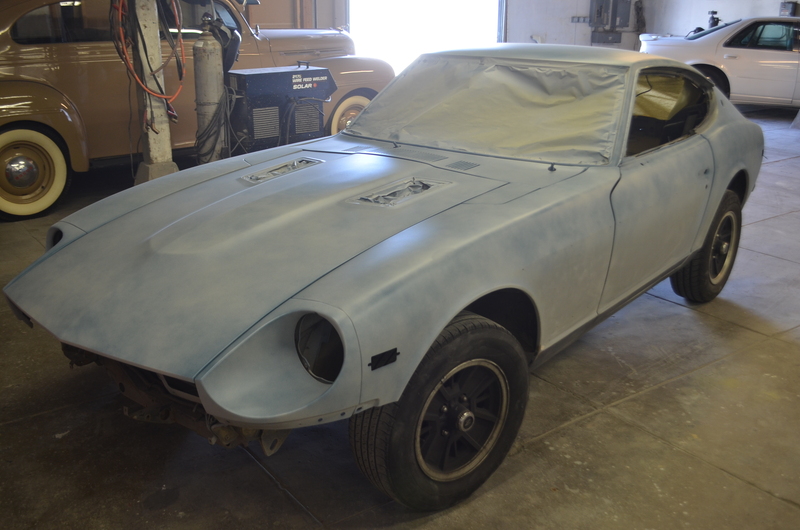 &lt;a href=”http://polldaddy.com/poll/5809302/”&gt;NEW SHIRT: what color should the 280z be painted?&lt;/a&gt;&lt;br/&gt;&lt;br /&gt; &lt;span style=”font:9px;”&gt;(&lt;a href=”http://www.polldaddy.com”&gt;polls&lt;/a&gt;)&lt;/span&gt;&lt;br /&gt;And the winner is GOLD POLY! LOoooooove that yellow color – like sunrise or sunset. Well it was a super close one! With a total of 15 votes: 6 went to Gold, 5 went to White, and 4 went to Grey! It really just says that all these colors are fabulous! 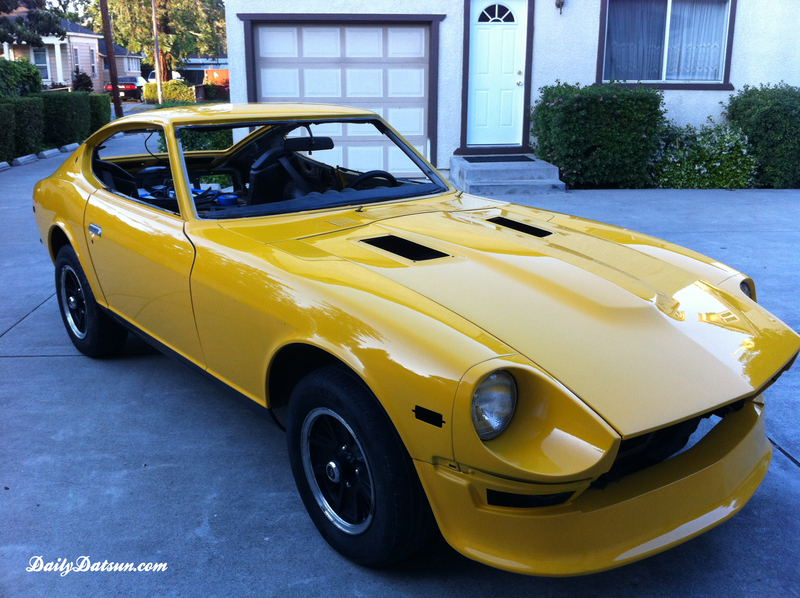 Speaking of which there’s actually a gold/yellow ’76 280z on Craigslist right now! Looks to be of good running order with a nice amount of fixes / upgrades (5-speed, new fuel pump, Magnaflow exhaust..). Best of all though it presumably has LOW miles: 51k! And a good price too… hmm…. 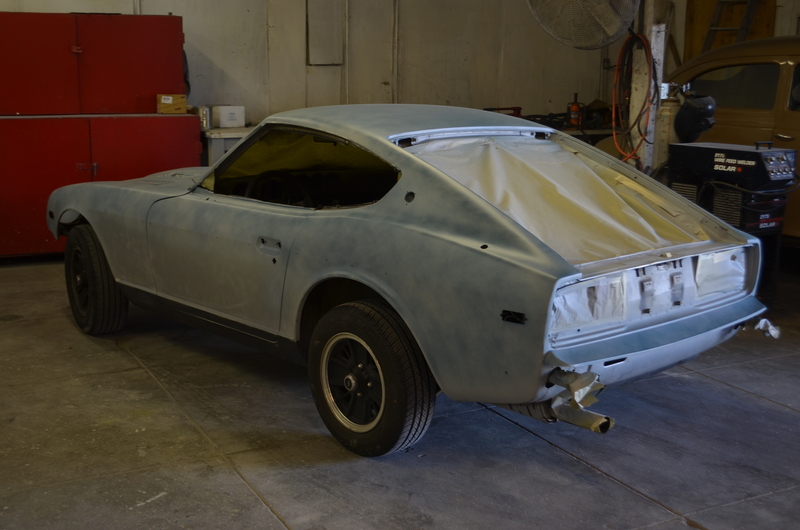 Even with it’s “bad” issues (some rust, gas gauge off, no interior) i would’ve have hesitated: $1700 for the color I want equates to nothing if i sell my current 280z… If only it had the old school blue CA plates!